The Accessibility setting controls the access to your Moodle course. When Moodle courses are created, they are set to be "Unaccessible" or hidden from students. This prevents students from opening a course before you are ready for them to see it. 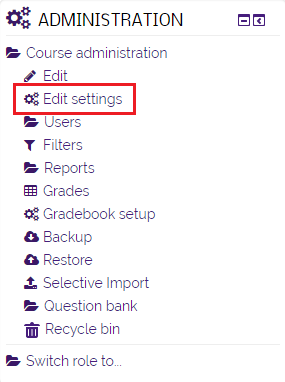 When you are ready for students to access your course, you can change the Accessibility setting through the Edit settings link in the Administration block. 2. Click on the Course that you want to update on the left side of the screen. 3. Click on the Edit settings link in the Administration block. 4. Under the General tab, locate the Available to students option. Change the option to Show which is located in the middle of the menu under Course start date. 5. Click the Save changes button on the bottom of the page. Your students will now be able to access your course.